Should you cancel your Jilt account? If you have no current need for sending out recovery emails, but wish to keep a pulse on your abandoned orders, cancellation is not the best answer. Once you cancel your Jilt account, you may lose all of your settings -- from your email campaign customizations to your domain settings -- and the app will stop tracking your abandoned orders. Stopping your Jilt campaign allows you to ensure you retain your settings and abandonment history. There are no charges for an inactive campaign since no emails are sent out. And you'll be able to easily reach out to the abandoned orders at a later date with a One Time campaign. 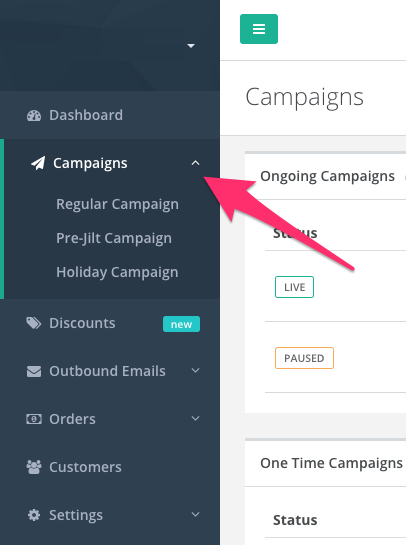 For a multi-email campaign, any remaining scheduled emails will continue to be sent while the campaign is paused. If you prefer that all scheduled emails finish sending, then there's no need to go to the next step. Note: Billing charges may apply if a new billing cycle occurs while the paused campaign is still sending out scheduled emails. To prevent additional charges, make sure to stop the campaign. 4. Click the Stop button next to any Paused campaign. Your campaign's status will then be updated to Stopped. Emails will no longer send out and no additional charges will occur. Jilt will continue to track and report on all new abandonments which will be displayed on your Dashboard - for your convenience. If you still would like to cancel your account, just let us know and we'll be happy to assist.